Shopping for a resonator guitar can be a very difficult task. 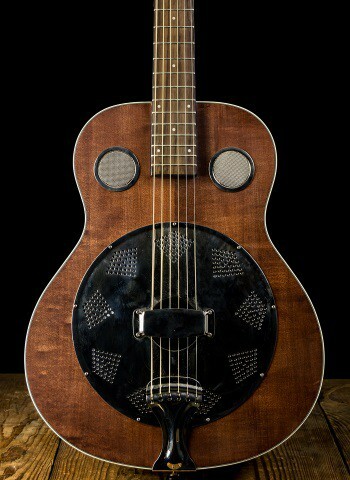 There is not as much of an abundance of information on resonator guitars as opposed to their acoustic guitar brothers. At N Stuff Music our selection of resonator guitars is made to provide a quality selection of fine instruments to both the beginning resonator player and the seasoned veteran. 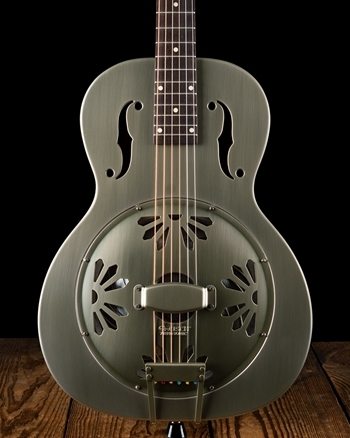 Resonator Guitars are undeniably one of the most natural and pleasant sounding instruments. Their wooden bodies combined with metal resonators give these guitars completely unique acoustic properties. Originally intended just to be a louder option for an acoustic guitar, resonators were quickly known for their distinctive sound and became a heavy portion of the sounds of folk, blues, and bluegrass genres. Artists such as the great Jerry Douglas have taken resonator player to a whole new level in his ability to use it as a solo and improvisation instrument in addition to playing that iconic resonator sound on countless records. The Fender Brown Derby Resonator guitar is a wonderful option especially for the player looking do begin their resonator journey. It features a hand-spun aluminum Eastern European "Continental" resonator cone. With Laminated mahogany wood and vintage style frets the Fender Brown Derby resonator carries an abundance of the classic resonator tone. 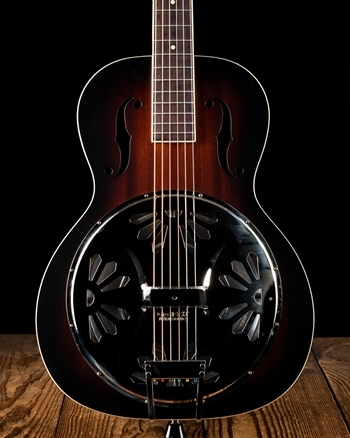 For the more experienced resonator player there is the Gretsch G9201 Honey Dipper Round-Neck resonator which features a unique Bell Brass body. The Gretsch Ampli-Sonic Biscuit Resonator Cone and Bridge gives this resonator a very pronounced sound and excels when finger-picking or playing slide; capped with Grover tuners, this resonator's intonation will not cause even the slightest worry. Resonator Guitars have an iconic sound that can be achieved by nothing other than resonators themselves. It is an instrument that has soothed the amazing sounds of artists such as Alison Krauss, Dolly Parton, Ricky Skaggs, and countless others. At N Stuff Music we see the importance to carry a selection of resonator guitars in order to further the tradition of their iconic folk, bluegrass, and country sound. Please feel free to contact us to check out any of our resonator guitars. You can chat with us online, email us at [email protected], as well as come into our lovely store in Blawnox, Pennsylvania fifteen minutes east of the city of Pittsburgh. We are always happy to discuss our instruments with customers in order to find the exact best fit for them musically. This mission has brought our customers back to us time and time again. We hope to be doing business with you and thank you for checking out N Stuff Music!